P.A.G. Space Battles is two player wargame played with cards laid on a tabletop, each card represents one space ship or piece of terrain. The Pink Empire and the Green Conglomerate have been at war for centuries with no end in sight. You take control of one these factions, play out your space ships onto the tabletop and seek to DESTROY the opposing force with laser cannons and manoeuvre. 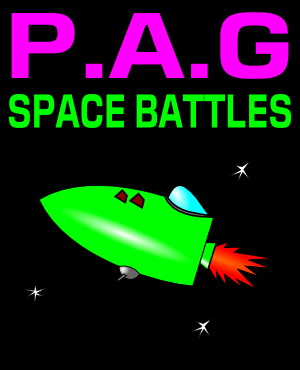 Using a comic art style and an easy-to-learn system P.A.G Space Battles will appeal to the younger player, or the older player just looking for a beer and pretzel game. Games can last anywhere from 30 to 60 minutes depending of the selected scenario and the size of the forces involved. Five scenarios are included, but you're not limited to just those games. Select your fleets, place down some terrain and battle away in the vacuum!